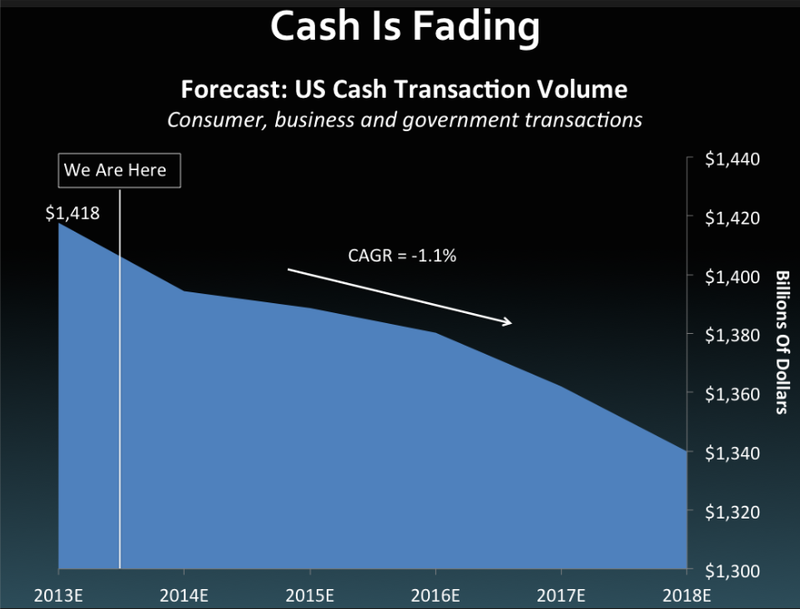 At first glance, this graph implies that U.S. cash transaction volume is plummeting. But look at the right side. The axis starts at $1,300 billion. If this graph had 0 on the Y axis, the line would essentially be flat. As posted, the graph is highly misleading. Not using zero as the basis of the Y axis can be useful in certain cases, like analyzing short-term price movements in a stock. But this is a terrible use of it. Or maybe it’s a great use — because the writer wants to make a point unsupported by the data. But it’s still wrong. Bonus error pointed out by a reader: The “We Are Here” line shows us between 2013 and 2014. We’re between 2014 and 2015.